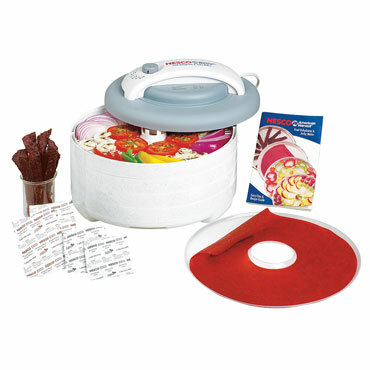 It's simple to make healthy snacks, homemade jerky and delicious toppings for salads or stir-fries with our dehydrator. Simply lay fruit, vegetables, or meat slices on the insert trays, adjust the temperature between 95-160° F, let it run for a few hours, and voila! Its patented drying fan operates at 1,000 watts to reach each tray evenly--meaning there's no need to rotate the trays. It's expandable, too! Flip through the included recipe and ideas booklet for more tasty inspiration.